Joseph Hackmey, Spink Shreves, February 2009, lot 1015; with 1947 R.P.S.L. and 1983 Holcombe certificates. Scott No. 3 $55,000. Campbell Paterson No. A6a $125,000 ($85,500). SG No. 3 £45,000 ($59,130). 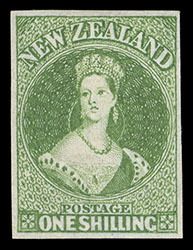 A STUNNING GEM, WITHOUT QUESTION ONE OF THE FINEST OF THE FEW RECORDED UNUSED EXAMPLES OF THIS VERY RARE STAMP. John Woolfe, Spink, October 2006, lot 250; with 1948 R.P.S.L. certificate. Scott No. 3. Campbell Paterson No. A6a $75,000 ($51,300). SG No. 3 Estimate $7,500 - 10,000. 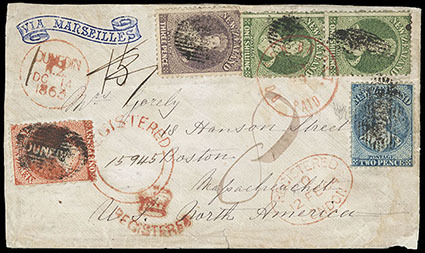 ONE OF ONLY FIVE RECORDED COVERS BEARING THE UNBISECTED 1S LONDON PRINTING FIRST ISSUE. 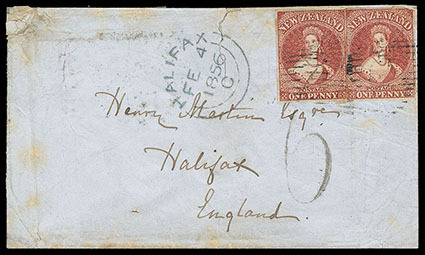 This cover was carried by "Thomas and Henry" from Dunedin to Melbourne, then by E & A "European" from Melbourne to Suez (via Galle), then RMSP "Teviot" from Alexandria to Malta, and finally RMSP "Wye" to Marseilles. 2. 1858 Mar. 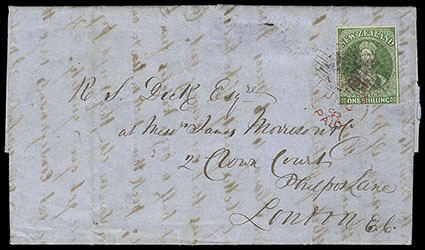 8, Otago to London, England bearing 1s single, ex-Agabeg, Dumas and Woolfe, the cover offered here. 5. 1858 Oct. 27, New Plymouth to Bridport, Dorset bearing 1s single, ex-Hackmey. Paul Kruger (2016 private sale); with 2015 Odenweller certificate. Scott No. 6. Campbell Paterson No. A6b $100,000 ($68,400). SG No. 6 £40,000 ($52,560). 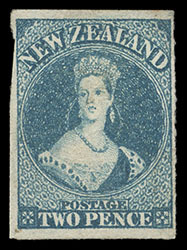 A REMARKABLE UNUSED EXAMPLE OF THE 1856 1S AUCKLAND PRINT ISSUE. Joseph Hackmey, Spink Shreves, February 2009, lot 1268; with 1988 Holcombe certificate. Scott No. 21. Campbell Paterson No. A1g. SG No. 81 £12,500 as singles ($16,420). 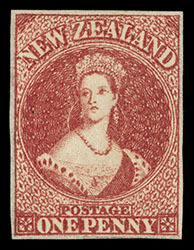 A STUNNING USED MULTIPLE OF THE 1863 1D ORANGE VERMILION ON PELURE PAPER, THE LARGEST KNOWN MULTIPLE OF ANY PELURE PRINTING. 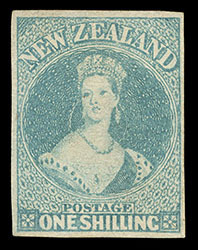 New Zealand, 1857, Queen Victoria "Chalon Head", 1s blue green, imperf, unwatermarked, unused without gum, full to large margins, beautiful bright color and impression, Extremely Fine and choice, Paul Kruger (private sale); with 2012 Odenweller certificate. Scott No. 10. Campbell Paterson No. A6c (2). SG No. 17 £17,000 ($22,340). 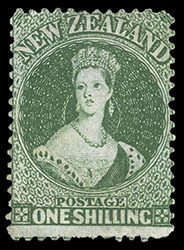 A STUNNING EXAMPLE OF THE RARE 1857 1S BLUE-GREEN IMPERF ISSUE, SURELY ONE OF THE FINEST RECORDED EXAMPLES. Paul Kruger (private sale); with 2010 B.P.A. and 2014 Odenweller certificates. Scott No. 25a. Campbell Paterson No. A6f (W). SG No. 94 £14,000 ($18,400). 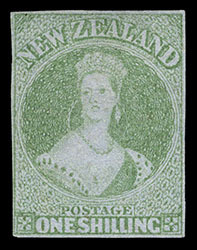 A MAGNIFICENT UNUSED EXAMPLE OF THE EXCEPTIONALLY RARE 1862 1S DEEP GREEN ON PELURE PAPER PERF 13. References: Illustrated in Odenweller as part of fig. 6.13, p. 106. Vivian Sussex, Cavendish, March 2002, lot 359; signed Holcombe, with 2001 B.P.A. certificate. Scott No. 20b. Campbell Paterson No. A6e (5). SG No. 80 Estimate $7,500 - 10,000. THE ONLY RECORDED RECORDED FOUR-COLOR PERF 13 FRANKING. A REMARKABLE REGISTERED USE TO THE UNITED STATES. Cover prepaid 2s 6d for the 1s 6d rate to the United States plus 1s registry fee.